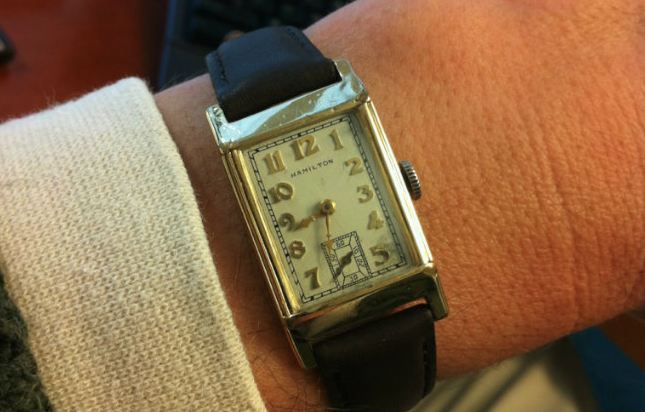 The 1935 Bartley (sometimes called the Bartlett, I think) was one of the first watches to utilize the 14/0, 17 jewel 980 movement. It was made for only two years and would probably be described as a "tank-style" watch. The 14K gold filled case came in yellow only with highly polished surfaces on top and bottom toward the lugs. Three dials were available, the applied gold numeral (AGN) dial, an applied gold marker (AGM) dial (shown in the ad), or a black inlaid enamel dial. It was originally sold at a higher cost than other filled watches because it has a higher percentage of gold applied to the case - probably to accommodate the mirror lapped area polishing. I can't say it's a model that comes up very frequently. I happened upon one a while back thinking it was a different model (a Calvin) and it was only after I tried to install the crystal that I realized I had a different model in my hands. I'd say it's best described by the flat, angled surfaces from the crystal to the lug tips as well as the narrow groove that runs along the left and right sides of the crystal. The case seems to wear at the corners of the crystal mostly, but wear to the edges is certainly possible since the case is very rectangular with prominent edges. It's a nice looking watch though, I think. Here's a wrist shot of mine.